With this easy-to-use timeline software, users can create engaging timelines in minutes to facilitate your project planning and project management. Why use timeline for project planning? There are many project planning tools, but timeline owns its unique strength in some special points. The key to a successful project is the planning. No matter you are a project manager, group leader or activity organizer, creating a project plan is always the first thing to do when undertaking any project. You need to define the project scope and determine an appropriate time schedule to complete the project. Then it becomes the guide for project's practitioners to follow. Timeline displays a list of events or steps in chronological order within a certain period of time. 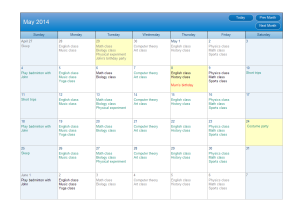 It can be used as a great tool to plan a project and track the project schedule. 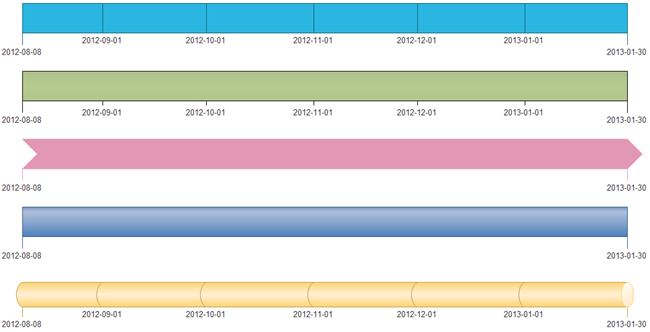 Timeline doesn't contain much detail, which makes it look more simple and intuitive than a Gantt chart. The main body of a timeline is a horizontal bar showing time progressing from left to right. You can use small bars to represent the duration of a sub activity, or use milestones to mark the events or steps to indicate when they should or did happen. Here shows an easy example of project timeline. From the example above we can see timeline is pretty high-level, but it's clear and integral. That's why it is preferred by lots of people when having presentation, since it can save tons of words from explaining the project. Besides, you can also send it to stakeholders to keep track of the progress, or print it out and present on the bulletin board in your office. How long does it take to create a timeline? With the correct tool, you don't need to spend much time creating a timeline. With lots of automatic functions and pre-made shapes, Edraw timeline software allows you create a timeline in just minutes. Now let's see some of its great features. Each shape is designed with a smart button, through which you can set time interval, milestone and change the shape style. Use dynamic control button to adjust the text direction and height of a milestone. Edraw is designed especially for people who don't know much about drawing. Even though you are a novice, as long as you can use a microsoft word, you can easily handle this, since our interface is quite same like the microsoft program. Click the following link to learn how to create a timeline with Edraw. Or you can watch this video: Timeline Tutorial. If you still have any problem, please contact our technical support. Any inquiry will be replied within 24 hours. 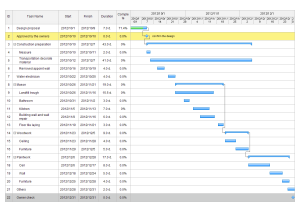 Gantt chart, commonly used for tracking project schedules, is one of the most popular and useful ways of showing activities, tasks or events displayed against time. Click the picture to see a detailed gannt chart solution. Calendar software allows you to create customized calendars for time schedule, planning, scheduling appointments, meetings, birthdays, vacations, special events from templates. It supports weekly, monthly, or yearly calendar. 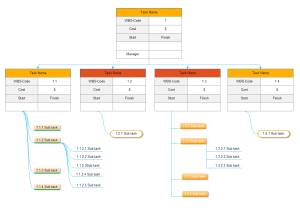 A work breakdown structure (WBS) is a chart in which tasks are illustrated to portray their relationships to each other and to the project as a whole. WBS helps you analyze and divide your project into work packages and dependencies by providing a common framework for the natural development of the overall planning and control of a project.